I just saw a mouse skitter across the back shelf near the sink and the kitchen compost bin. It looked like something in a movie, its silhouette dark against the morning grey of sky through my back window. Where were the cats my first thought and then the realisation my heart was thumping as if I’d seen something far worse than a mouse. I’ve been trained from early days to look upon mice roaming free in my kitchen as a health hazard. I know we have mice but I figured they live in the back garden or under the house, not bold and obvious to see in my kitchen. Mice bring in the ‘yuk’ factor, as if I’ve been contaminated by something. I imagine its little mice feet riddled with germs which get scattered across my bench top or was it worse? Albeit a small rat but still a plague carrying monster from the bowels of some underground sewer? I reckon the yuk factor must signal something primitive inside, something of the first words we hear from our parents when we have failed the cleanliness test, most probably in the toilet when we’ve made a mess or in our nappies or even when as my daughters used to do when they were little, though I have no such memories of doing this myself, put together as many different ingredients they could find from the bathroom cabinet. The sorbolene cream mixed with shampoo and then a visit to the kitchen to add flour and rice for texture then a visit to the garden to throw in a few rose petals and leaves, then a visit back to the bathroom to add a little colour in the form of whatever hair products might have existed in our cupboards in those days. Stir the lot with a big stick and there you have it: Yuk. 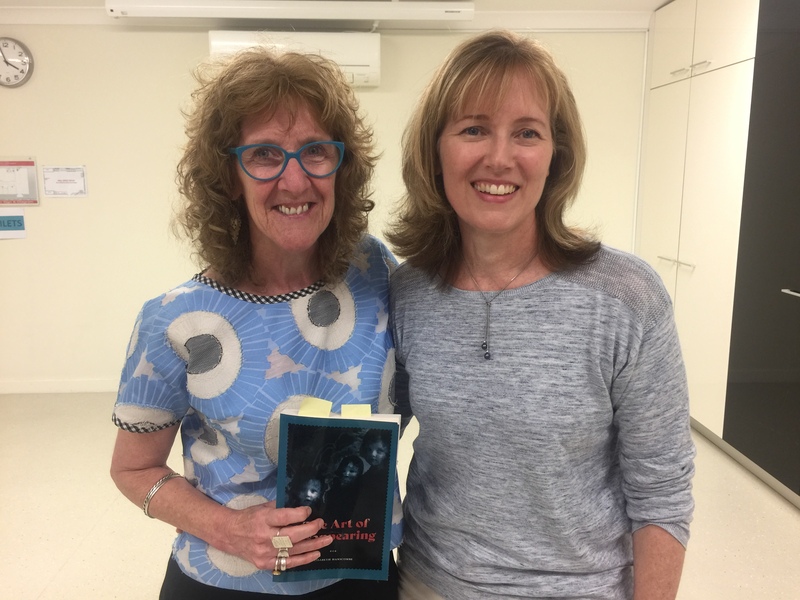 I went yesterday to my second book launch in Brisbane, a combined event where several people show cased – that’s the word they use these days – show cased their boks. We were meant to do some sort of reading to impress people, even strangers enough to want to read our work. I managed to sell a couple of copies to strangers, the rest to family who are always the best buyers of your book. Family have an investment in your words in a way that strangers do not. I also met a lovely Facebook friend, Fiona Robertson, only newly arrived in my life through another Facebook friend, Louise Allan, and Fiona told me I should go over to Twitter. ‘Twitter is where the writers hang out,’ she said. I have a twitter account but I use it so rarely I can’t even remember my password. Must I travel to this land where you are restricted to such a short word count it might challenge me rather like the mouse or rat that ran across my kitchen bench challenges me? Must I introduce something else into my life, the likes of which I do not understand at present, though I once felt this way about Facebook and now I enjoy my time there in a way I once partied in the blog world? Now my visits to blogdom are weekly, while I visit Facebook several times a day. This is the reason I have elected to stay away from online worlds when I am away from home. If I need to escape temptation I can leave the house. I’m not the first to complain of an online addiction, the first writer to say, it takes up too much time. But I have found I enjoy these addictions, these distractions, these seductions that lure me away temporarily but then after I have had my fill, they leave me free to go back to the pleasures of writing. That is, until I see a rat in my kitchen and my heart heaves. As for Twitter, you’re exactly right – it is yet another potential addiction, for sure. On my writing days, I have a brief look at breakfast time, then don’t allow myself to look again until I’m finished writing for the day. Otherwise I’d get nothing done! By the way, if any blog readers want to order your book, how should they do that? I read the first couple of pages this morning and wanted to just keep going, even though I’m partway through another wonderful book. I’m sure other readers will be keen to read your memoir, too! So much of our time in this writing life, Fiona, where we have to juggle family, work and life generally with a need to write, involves staving off those temptations and distractions that litter our path. We find our ways I reckon or else suffer the torment of frustrated desire. Or you can ask me to organise a copy for you, via email: lis@hanscombe.com.au. A few years back I was sitting in my chair in my office in the early hours of the morning as is my wont when I noticed movement in the hall: a mouse. The creature paused when it realised it had been observed, took note of me and then (unhurriedly) went about its business which was (apparently) in our living room. This was the first mouse I’d ever seen indoors in my life apart from one my mother discovered in the grill but only after she’d grilled the poor thing to death. (I never understood why it never fled as soon as it sensed the heat above it.) Anyway after that first sighting there were others and the wee buggers were quite bold, skittering around the place while we watched TV. Neither Carrie nor I were the slightest bit bothered by this. If anything we were quite delighted by our visitors. Of course their stay couldn’t last and Carrie ordered humane traps which proved effective and twice I think that first year I trudged up the hill behind our house to release them into the wild. The next year they (or their cousins) returned. This time there were babies and on one occasion I let three of them go up the hill and I can’t pretend I wasn’t a bit sad about that because they were clearly now mother- and fatherless now and there was snow on the ground. But that was it. No visitors the next year and none since. Never seen a rat in my life. I used to have a Twitter account but I gave up on it a while back. I could never get the hang of it. I never knew who I was talking to and could never think of anything worth saying in 140 characters. I can’t imagine what all these writers there are talking about. The only social media I take any interest in is Facebook but the most I do there is spend five or ten minutes in the morning scrolling down the page until I get to something I remember seeing the day before and that’s me. I dutifully like my wife’s posts and occasionally like some of my friends’ posts but that’s about it. Since I found out about how Facebook takes it upon itself to decide which of my friends’ posts I get to see I find I don’t have much time for it. The ROI is negligible. By all means tell people about your book there and you might sell one or two but there are too many other people trying to sell us things these days and we only have so many spare pennies. How do you pick? This is a very bad time to try to promote anything. We are living in peak times. And not just peak. All my cups overfloweth. Too many books. Too many films. Far too many TV shows. Way too much music. And a constant supply of news. A shame you only sold a couple of copies of your book in Brisbane. Is that the end of the readings? What else is your publisher doing to promote the book? You’ve been on the radio before. That would be worth trying again. And what about the local papers? You’ll blink twice and be old news, you know that. In the early days I spent a lot of time trying to get people to review my books online. I did okay and the reviews were always decent but the readership of these sites was miniscule and the effort pointless other than making me feel better about calling myself a writer. No mouse sightings since Sunday, Jim, and I’m okay with that, knowing they’re there but not having to see them. Not that I’m usually into that level of denial, only sometimes. As for promoting my book, I’m trying, but it’s not easy. I can’t stand the idea of using a megaphone to shout out to one and all read my book, but that feels like the way it is. So I try to spruik in subtle ways. Thanks for the reminder of the local newspaper. I can always try them, but how to reach a person beyond a digitised voice. Thanks Jim. I have a Twitter account but I just use it to pass along interesting things I come across online. I hardly ever post anything original on it. I’ve got other outlets for that. It’s funny when you first begin to use these online forums it can be really scary and then somehow you slide into it. I’m still scared. But I’ll get used to it. Thanks Kirk.